Ankle brace with two straps. Mild ankle pain, mild to moderate sprain, ankle instability, arthritis, bursitis, tendinitis, or if you need more reinforcement and protection than it provides easy ankle brace. 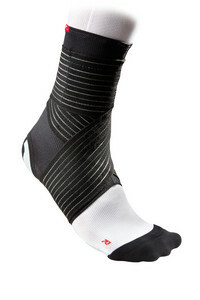 Completely breathable stretchy ankle socks with two elastic bands in the shape of the numeral "8" with adjustable tensioning with Velcro (Velcro ®). Provides gentle withdrawal and reinforcement of soft tissues.